I have always been fascinated with the Goshiki variety, with its many variations of color, reticulation and pattern. Recently goshiki have been divided into two sub-types: Light, or mameshibori (also sometimes called kindai) goshiki, and dark, or kuro goshiki. 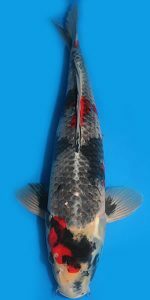 The light version looks much like a kohaku but with thin crescent-shaped dark blue reticulation appearing on the white skin, whereas the darker kuro goshiki sometimes has reticulation on the red as well, with the white area becoming almost completely dominated by heavy dark blue reticulation – appearing almost like black or dark purple rather than white. The original meaning of goshiki is “five-colored”. These colors are white, black, red, light blue, and dark blue. When mixed on some goshiki (i.e. kuro) the ground (main, or background color of the body) can appear as purple, which makes for a really cool looking fish! This variety was originally placed in the kawarimono (or “miscellaneous”) class for judging purposes, but due to great efforts to improve and refine the variety, it was recently upgraded to a combined koromo/goshiki class. The reason these two varieties are combined into one class is that they are of the same genetic blend – kohaku and Asagi. The kohaku gene contributes the red patterning on a white background while the Asagi gene contributes the reticulation. 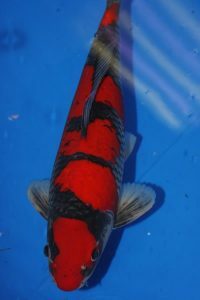 In the case of koromo this reticulation is restricted to the red areas, while with goshiki the reticulation is usually restricted to the white areas (the exception being kuro goshiki as mentioned above which sometimes has reticulation on both the red and white areas). Two popular variations of goshiki are goshiki sanke ( aka goshiki sanshoku) and goshiki showa. These will appear as normal goshiki with added small black patches in the case of goshiki sanke or with added larger black wrapping markings in the case of goshiki showa. Both of these types are placed in the kawarimono class for judging purposes. When selecting a young goshiki for your collection you should first look for a pleasing kohaku pattern. Sandan (three-step) is ideal on a goshiki because it provides for a large amount of white area to accentuate the reticulation. Judges are a bit more lenient regarding the placement of the red on the head of a goshiki. 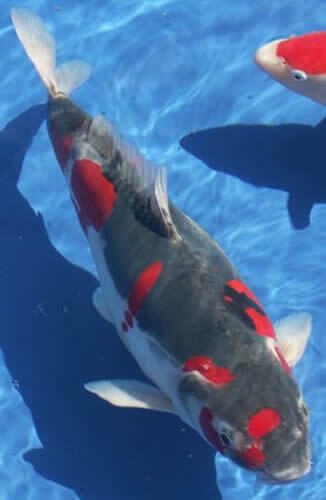 For example, a goshiki with either too much or not enough red between the tip of the nose and the eyes will be acceptable as long as the red is bright and clean and the white provides a pleasing background, giving the koi an artistic look. The fins should be either all white or can have red at the base (moto aka). The reticulation should be even (not irregular or splotchy appearing) and the red should appear almost to be floating on the ground – a unique characteristic of high quality goshiki. 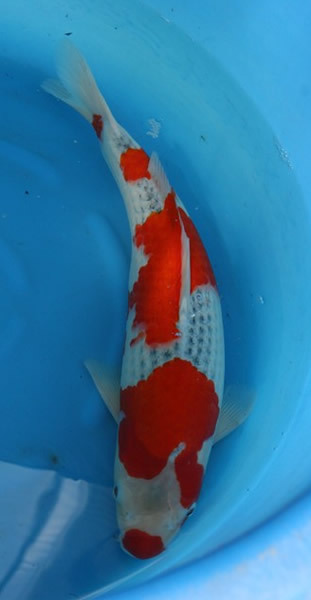 Young goshiki will often appear to be kohaku, as the reticulation normally does not appear until later. You have to trust your dealer in this respect, who should know the lineage of the fish he is selling. Whether you fancy the kuro goshiki or the elusive ( ‘been looking for one for years!) mameshibori goshiki, this variety will certainly delight and will be a big attraction in your pond.